Specificité The antibody recognizes a 90 kD protein, corresponding to the apparent molecular weight of Hsp90 on SDS-PAGE immunoblots. 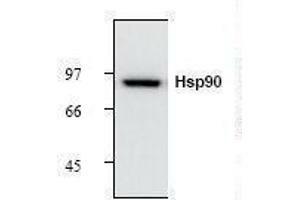 This antibody detects both Hsp90 alpha and beta. Buffer PBS, 1 mg/mL BSA, 50 % glycerol, 0.2 % Thimerosal. Précaution d'utilisation This product contains Thimerosal (Merthiolate): a POISONOUS AND HAZARDOUS SUBSTANCE which should be handled by trained staff only.